Onyx is a variety of cryptocrystalline silicon dioxide or chalcedony. It is banded with contrasting colors making it an excellent medium for three dimensional cameo and intaglio style carving. Cameos are usually carved with the white layer in relief and the darker color as background. In intaglios, the figure is incised through the dark layer, to reveal lighter colors underneath. Onyx is a term also often used when referring to only black, non-banded microcrystalline quartz. This is in the strictest sense incorrect, but it is so widely used and understood that is is commonly accepted. The name "onyx" has been misapplied to banded or streaked varieties of calcite. "Mexican onyx", "Brazilian onyx", "Algerian onyx", "Yava onyx" and "cave onyx" are all misleading terms that refer to stalagmitic calcite. Naturally occurring black and white onyx is quite rare, but it can be commercially produced by soaking pale agate in a sugar solution and then carbonizing the sugar in sulfuric acid. This treatment produces layers that are black and white. The name comes from the Greek word, onux, which means fingernail or claw. Mythology states that one night Eros trimmed Venus' fingernails, and the gods turned these clippings into the stone known as onyx. Onyx is prized for rosary beads, as the Christians held on to the pagan beliefs that onyx had great medicinal benefits. 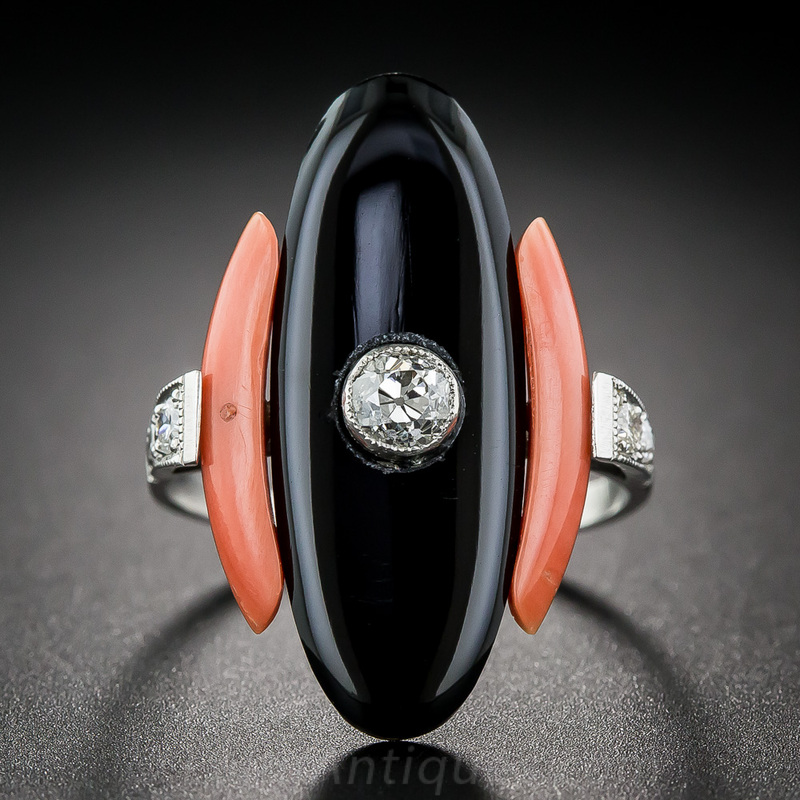 Onyx was attributed with the ability to make wounds heal faster and childbirth go smoothly. Black Onyx was a favorite in the mourning jewelry of England’s Mid-Victorian Period. The jewelry of this period was often melancholy and reflected the monarch’s sadness at the loss of her beloved Prince Albert. Onyx is associated with the astrological symbols of Scorpio, Capricorn and Leo. It commemorates the 7th Anniversary, and symbolizes the midnight hour. Onyx is considered to be a very spiritual stone. New Age Crystal Mystics view onyx as a grounding stone strengthening their connection with the earth during meditation or providing guidance with astral travel. The black and white colors of onyx balances the Yin and Yang. Physically, onyx has been attributed with strengthening the immune system, and improving the condition of skin, nails and hair. It has long been associated with improving problems with the pancreas. Similar Stones: molded plastics, glass and porcelain make excellent imitations for cameo carvings.